"Mutually assured destruction" redirects here. For the episode of The Americans, see Mutually Assured Destruction (The Americans). Mutual assured destruction or mutually assured destruction (MAD) is a doctrine of military strategy and national security policy in which a full-scale use of nuclear weapons by two or more opposing sides would cause the complete annihilation of both the attacker and the defender (see pre-emptive nuclear strike and second strike). It is based on the theory of deterrence, which holds that the threat of using strong weapons against the enemy prevents the enemy's use of those same weapons. The strategy is a form of Nash equilibrium in which, once armed, neither side has any incentive to initiate a conflict or to disarm. Under MAD, each side has enough nuclear weaponry to destroy the other side and that either side, if attacked for any reason by the other, would retaliate with equal or greater force. The expected result is an immediate, irreversible escalation of hostilities resulting in both combatants' mutual, total, and assured destruction. The doctrine requires that neither side construct shelters on a massive scale. If one side constructed a similar system of shelters, it would violate the MAD doctrine and destabilize the situation, because it would have less to fear from a second strike. The same principle is invoked against missile defense. The doctrine further assumes that neither side will dare to launch a first strike because the other side would launch on warning (also called fail-deadly) or with surviving forces (a second strike), resulting in unacceptable losses for both parties. The payoff of the MAD doctrine was and still is expected to be a tense but stable global peace. The primary application of this doctrine started during the Cold War (1940s to 1991), in which MAD was seen as helping to prevent any direct full-scale conflicts between the United States and the Soviet Union while they engaged in smaller proxy wars around the world. It was also responsible for the arms race, as both nations struggled to keep nuclear parity, or at least retain second-strike capability. Although the Cold War ended in the early 1990s, the MAD doctrine continues to be applied. Proponents of MAD as part of U.S. and USSR strategic doctrine believed that nuclear war could best be prevented if neither side could expect to survive a full-scale nuclear exchange as a functioning state. Since the credibility of the threat is critical to such assurance, each side had to invest substantial capital in their nuclear arsenals even if they were not intended for use. In addition, neither side could be expected or allowed to adequately defend itself against the other's nuclear missiles. This led both to the hardening and diversification of nuclear delivery systems (such as nuclear missile silos, ballistic missile submarines, and nuclear bombers kept at fail-safe points) and to the Anti-Ballistic Missile Treaty. This MAD scenario is often referred to as nuclear deterrence. The term "deterrence" is now used in this context; originally, its use was limited to legal terminology. One of the earliest references to the concept comes from the English author Wilkie Collins, writing at the time of the Franco-Prussian War in 1870: "I begin to believe in only one civilizing influence—the discovery one of these days of a destructive agent so terrible that War shall mean annihilation and men's fears will force them to keep the peace." Richard Jordan Gatling patented his namesake rotary gun in 1862 with the partial intention of illustrating the futility of war. After his 1867 invention of dynamite, Alfred Nobel stated that "The day when two army corps can annihilate each other in one second, all civilized nations, it is to be hoped, will recoil from war and discharge their troops." Jan Gotlib Bloch in The Future of War, published in 1898, argued that the state could not fight a war "under modern conditions with any prospect of being able to carry that war to a conclusion by defeating its adversary by force of arms on the battlefield. No decisive war is possible that will not entail even upon the victorious Power, the destruction of its resources and the breakup of society. War has therefore become impossible, except at the price of suicide." In 1937, Nikola Tesla published The Art of Projecting Concentrated Non-dispersive Energy through the Natural Media, a treatise concerning charged particle beam weapons. Tesla described his device as a "superweapon that would put an end to all war." In March 1940, the Frisch–Peierls memorandum anticipated deterrence as the principal means of combating an enemy with nuclear weapons. Atomic bomb explosions over Hiroshima, Japan, 6 August 1945 (left) and over Nagasaki, Japan, 9 August 1945 (right). 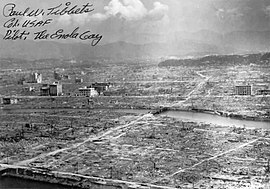 In August 1945, the United States accepted the surrender of Japan after the nuclear attacks on Hiroshima and Nagasaki. Four years later, on August 29, 1949, the Soviet Union detonated its own nuclear device. At the time, both sides lacked the means to effectively use nuclear devices against each other. However, with the development of aircraft like the American Convair B-36 and the Soviet Tupolev Tu-95, both sides were gaining a greater ability to deliver nuclear weapons into the interior of the opposing country. The official nuclear policy of the United States became one of "massive retaliation", as coined by President Dwight D. Eisenhower's Secretary of State John Foster Dulles, which called for massive attack against the Soviet Union if they were to invade Europe, regardless of whether it was a conventional or a nuclear attack. By the time of the 1962 Cuban Missile Crisis, both the United States and the Soviet Union had developed the capability of launching a nuclear-tipped missile from a submerged submarine, which completed the third leg of the nuclear triad weapons strategy necessary to fully implement the MAD doctrine. 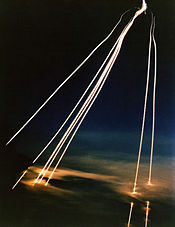 Having a three-branched nuclear capability eliminated the possibility that an enemy could destroy all of a nation's nuclear forces in a first-strike attack; this, in turn, ensured the credible threat of a devastating retaliatory strike against the aggressor, increasing a nation's nuclear deterrence. The RAND corporation futurist and cold war strategist Herman Kahn (1922–1982) believed that although MAD was useful as a metaphor, when pushed to its logical conclusion it became absurd. In his 1960 book On Thermonuclear War he advocated a more reasoned approach to nuclear warfare and was understood by some of his critics to be a nuclear war hawk in his writings. (He did however hold a profound belief in the possibility of success in the event of a nuclear war.) He used the concept of the Doomsday Machine as an "idealized (almost caricaturized) device" to illustrate the danger of taking MAD to its extreme. He writes, "I used to be wary of discussing the concept for fear that some colonel would get out a General Operating Requirement or Development Planning Objective for the device". The term, "mutual assured destruction", was coined by Donald Brennan, a strategist working in Kahn's Hudson Institute, in 1962. The 1964 film Dr. Strangelove parodies some of Kahn's work, and the titular character makes parodic references to Kahn's research, as in this quote from the film (after the United States mistakenly launched a nuclear attack on the USSR): "Under the authority granted me as director of weapons research and development, I commissioned last year a study of this project [of a doomsday machine] by the Bland Corporation. Based on the findings of the report, my conclusion was that this idea was not a practical deterrent, for reasons which, at this moment, must be all too obvious." Sometime in the 1980s, a second, but real, doomsday device, called The Dead Hand, entered the picture in the Soviet Union. Unlike Kahn's device, it was not based on radioactive cobalt, but it was self-activated and could not be stopped. 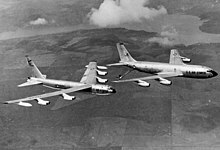 Beginning in 1955, the United States Strategic Air Command (SAC) kept one-third of its bombers on alert, with crews ready to take off within fifteen minutes and fly to designated targets inside the Soviet Union and destroy them with nuclear bombs in the event of a Soviet first-strike attack on the United States. In 1961, President John F. Kennedy increased funding for this program and raised the commitment to 50 percent of SAC aircraft. During periods of increased tension in the early 1960s, SAC kept part of its B-52 fleet airborne at all times, to allow an extremely fast retaliatory strike against the Soviet Union in the event of a surprise attack on the United States. This program continued until 1969. Between 1954 and 1992, bomber wings had approximately one-third of their assigned aircraft on quick reaction ground alert and were able to take off within a few minutes. SAC also maintained the National Emergency Airborne Command Post (NEACP, pronounced "kneecap"), also known as "Looking Glass," which consisted of several EC-135s, one of which was airborne at all times from 1961 through 1990. During the Cuban missile crisis the bombers were dispersed to several different airfields, and also were sometimes airborne. For example, some were sent to Wright Patterson, which normally did not have B-52s. During the height of the tensions between the US and the USSR in the 1960s, two popular films were made dealing with what could go terribly wrong with the policy of keeping nuclear-bomb carrying airplanes at the ready: Dr. Strangelove (1964) and Fail Safe (1964). The strategy of MAD was fully declared in the early 1960s, primarily by United States Secretary of Defense Robert McNamara. In McNamara's formulation there was the very real danger that a nation with nuclear weapons could attempt to eliminate another nation's retaliatory forces with a surprise, devastating first strike and theoretically "win" a nuclear war relatively unharmed. True second-strike capability could be achieved only when a nation had a guaranteed ability to fully retaliate after a first-strike attack. The United States had achieved an early form of second-strike capability by fielding continual patrols of strategic nuclear bombers, with a large number of planes always in the air, on their way to or from fail-safe points close to the borders of the Soviet Union. This meant the United States could still retaliate, even after a devastating first-strike attack. The tactic was expensive and problematic because of the high cost of keeping enough planes in the air at all times and the possibility they would be shot down by Soviet anti-aircraft missiles before reaching their targets. In addition, as the idea of a missile gap existing between the US and the Soviet Union developed, there was increasing priority being given to ICBMs over bombers. It was only with the advent of ballistic missile submarines, starting with the George Washington class in 1959, that a genuine survivable nuclear force became possible and a retaliatory second strike capability guaranteed. The deployment of fleets of ballistic missile submarines established a guaranteed second-strike capability because of their stealth and by the number fielded by each Cold War adversary—it was highly unlikely that all of them could be targeted and preemptively destroyed (in contrast to, for example, a missile silo with a fixed location that could be targeted during a first strike). Given their long range, high survivability and ability to carry many medium- and long-range nuclear missiles, submarines were credible and effective means for full-scale retaliation even after a massive first strike. This deterrence strategy and program has continued into the 21st century, with nuclear submarines carrying Trident II ballistic missiles as one leg of the U.S. strategic nuclear deterrent and as the sole deterrent of the United Kingdom. The USA's other such deterrent comprises the intercontinental ballistic missiles (ICBM)s on alert in the continental United States. Ballistic missile submarines are also operated by the navies of China, France, India and Russia. The U.S. Department of Defense anticipates a continued need for a sea-based strategic nuclear force. The first of the current Ohio-class SSBNs are expected to be retired by 2029, meaning that a replacement platform must already be seaworthy by that time. A replacement may cost over $4 billion per unit compared to the USS Ohio's $2 billion. The U.S. Navy is exploring two options. The first is a variant of the Virginia-class nuclear attack submarines. The second is a dedicated SSBN, either with a new hull or based on an overhaul of the current Ohio-class. In the 1960s both the Soviet Union (A-35 anti-ballistic missile system) and the United States (LIM-49 Nike Zeus) developed anti-ballistic missile systems. Had such systems been able to effectively defend against a retaliatory second strike, MAD would have been undermined. See also Strategic Defense Initiative. The multiple independently targetable re-entry vehicle (MIRV) was another weapons system designed specifically to aid with the MAD nuclear deterrence doctrine. With a MIRV payload, one ICBM could hold many separate warheads. MIRVs were first created by the United States in order to counterbalance the Soviet A-35 anti-ballistic missile systems around Moscow. Since each defensive missile could be counted on to destroy only one offensive missile, making each offensive missile have, for example, three warheads (as with early MIRV systems) meant that three times as many defensive missiles were needed for each offensive missile. This made defending against missile attacks more costly and difficult. One of the largest U.S. MIRVed missiles, the LGM-118A Peacekeeper, could hold up to 10 warheads, each with a yield of around 300 kilotons of TNT (1.3 PJ)—all together, an explosive payload equivalent to 230 Hiroshima-type bombs. The multiple warheads made defense untenable with the available technology, leaving the threat of retaliatory attack as the only viable defensive option. MIRVed land-based ICBMs tend to put a premium on striking first. The START II agreement was proposed to ban this type of weapon, but never entered into force. In the event of a Soviet conventional attack on Western Europe, NATO planned to use tactical nuclear weapons. The Soviet Union countered this threat by issuing a statement that any use of nuclear weapons (tactical or otherwise) against Soviet forces would be grounds for a full-scale Soviet retaliatory strike (massive retaliation). Thus it was generally assumed that any combat in Europe would end with apocalyptic conclusions. Their ability to carry multiple MIRV warheads at once, useful for destroying a whole missile field or several cities with one missile. Unlike a decapitation strike or a countervalue strike, a counterforce strike might result in a potentially more constrained retaliation. Though the Minuteman III of the mid-1960s was MIRVed with three warheads, heavily MIRVed vehicles threatened to upset the balance; these included the SS-18 Satan which was deployed in 1976, and was considered to threaten Minuteman III silos, which led some neoconservatives to conclude a Soviet first strike was being prepared for. This led to the development of the aforementioned Pershing II, the Trident I and Trident II, as well as the MX missile, and the B-1 Lancer. MIRVed land-based ICBMs are considered destabilizing because they tend to put a premium on striking first. When a missile is MIRVed, it is able to carry many warheads (up to eight in existing U.S. missiles, limited by New START, though Trident II is capable of carrying up to 12) and deliver them to separate targets. If it is assumed that each side has 100 missiles, with five warheads each, and further that each side has a 95 percent chance of neutralizing the opponent's missiles in their silos by firing two warheads at each silo, then the attacking side can reduce the enemy ICBM force from 100 missiles to about five by firing 40 missiles with 200 warheads, and keeping the rest of 60 missiles in reserve. As such, this type of weapon was intended to be banned under the START II agreement; however, the START II agreement was never brought into force, and neither Russia nor the United States ratified the agreement. The original U.S. MAD doctrine was modified on July 25, 1980, with U.S. President Jimmy Carter's adoption of countervailing strategy with Presidential Directive 59. According to its architect, Secretary of Defense Harold Brown, "countervailing strategy" stressed that the planned response to a Soviet attack was no longer to bomb Soviet population centers and cities primarily, but first to kill the Soviet leadership, then attack military targets, in the hope of a Soviet surrender before total destruction of the Soviet Union (and the United States). This modified version of MAD was seen as a winnable nuclear war, while still maintaining the possibility of assured destruction for at least one party. This policy was further developed by the Reagan administration with the announcement of the Strategic Defense Initiative (SDI, nicknamed "Star Wars"), the goal of which was to develop space-based technology to destroy Soviet missiles before they reached the United States. SDI was criticized by both the Soviets and many of America's allies (including Prime Minister of the United Kingdom Margaret Thatcher) because, were it ever operational and effective, it would have undermined the "assured destruction" required for MAD. If the United States had a guarantee against Soviet nuclear attacks, its critics argued, it would have first-strike capability, which would have been a politically and militarily destabilizing position. Critics further argued that it could trigger a new arms race, this time to develop countermeasures for SDI. Despite its promise of nuclear safety, SDI was described by many of its critics (including Soviet nuclear physicist and later peace activist Andrei Sakharov) as being even more dangerous than MAD because of these political implications. Supporters also argued that SDI could trigger a new arms race, forcing the USSR to spend an increasing proportion of GDP on defense—something which has been claimed to have been an indirect cause of the eventual collapse of the Soviet Union. Proponents of ballistic missile defense (BMD) argue that MAD is exceptionally dangerous in that it essentially offers a single course of action in the event of nuclear attack: full retaliatory response. The fact that nuclear proliferation has led to an increase in the number of nations in the "nuclear club", including nations of questionable stability (e.g. North Korea), and that a nuclear nation might be hijacked by a despot or other person or persons who might use nuclear weapons without a sane regard for the consequences, presents a strong case for proponents of BMD who seek a policy which both protects against attack, but also does not require an escalation into what might become global nuclear war. Russia continues to have a strong public distaste for Western BMD initiatives, presumably because proprietary operative BMD systems could exceed their technical and financial resources and therefore degrade their larger military standing and sense of security in a post-MAD environment. Russian refusal to accept invitations to participate in NATO BMD may be indicative of the lack of an alternative to MAD in current Russian war fighting strategy due to dilapidation of conventional forces after the breakup of the Soviet Union. 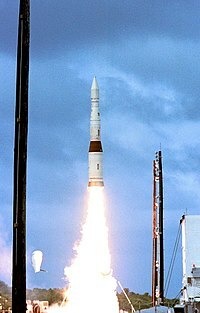 A payload launch vehicle carrying a prototype exoatmospheric kill vehicle is launched from Meck Island at the Kwajalein Missile Range on December 3, 2001, for an intercept of a ballistic missile target over the central Pacific Ocean. After the fall of the Soviet Union, the Russian Federation emerged as a sovereign entity encompassing most of the territory of the former USSR. Relations between the United States and Russia were, at least for a time, less tense than they had been with the Soviet Union. The administration of U.S. President George W. Bush withdrew from the Anti-Ballistic Missile Treaty in June 2002, claiming that the limited national missile defense system which they proposed to build was designed only to prevent nuclear blackmail by a state with limited nuclear capability and was not planned to alter the nuclear posture between Russia and the United States. While relations have improved and an intentional nuclear exchange is more unlikely, the decay in Russian nuclear capability in the post-Cold War era may have had an effect on the continued viability of the MAD doctrine. A 2006 article by Keir Lieber and Daryl Press stated that the United States could carry out a nuclear first strike on Russia and would "have a good chance of destroying every Russian bomber base, submarine, and ICBM." This was attributed to reductions in Russian nuclear stockpiles and the increasing inefficiency and age of that which remains. Lieber and Press argued that the MAD era is coming to an end and that the United States is on the cusp of global nuclear primacy. However, in a follow-up article in the same publication, others criticized the analysis, including Peter Flory, the U.S. Assistant Secretary of Defense for International Security Policy, who began by writing "The essay by Keir Lieber and Daryl Press contains so many errors, on a topic of such gravity, that a Department of Defense response is required to correct the record." Regarding reductions in Russian stockpiles, another response stated that "a similarly one-sided examination of [reductions in] U.S. forces would have painted a similarly dire portrait". A situation in which the United States might actually be expected to carry out a "successful" attack is perceived as a disadvantage for both countries. The strategic balance between the United States and Russia is becoming less stable, and the objective, technical possibility of a first strike by the United States is increasing. At a time of crisis, this instability could lead to an accidental nuclear war. For example, if Russia feared a U.S. nuclear attack, Moscow might make rash moves (such as putting its forces on alert) that would provoke a U.S. preemptive strike. An outline of current U.S. nuclear strategy toward both Russia and other nations was published as the document "Essentials of Post–Cold War Deterrence" in 1995. Whether MAD was the officially accepted doctrine of the United States military during the Cold War is largely a matter of interpretation. The United States Air Force, for example, has retrospectively contended that it never advocated MAD as a sole strategy, and that this form of deterrence was seen as one of numerous options in U.S. nuclear policy. Former officers have emphasized that they never felt as limited by the logic of MAD (and were prepared to use nuclear weapons in smaller-scale situations than "assured destruction" allowed), and did not deliberately target civilian cities (though they acknowledge that the result of a "purely military" attack would certainly devastate the cities as well). 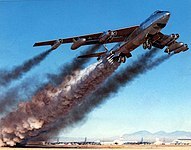 However, according to a declassified 1959 Strategic Air Command study, U.S. nuclear weapons plans specifically targeted the populations of Beijing, Moscow, Leningrad, East Berlin, and Warsaw for systematic destruction. MAD was implied in several U.S. policies and used in the political rhetoric of leaders in both the United States and the USSR during many periods of the Cold War. To continue to deter in an era of strategic nuclear equivalence, it is necessary to have nuclear (as well as conventional) forces such that in considering aggression against our interests any adversary would recognize that no plausible outcome would represent a victory or any plausible definition of victory. To this end and so as to preserve the possibility of bargaining effectively to terminate the war on acceptable terms that are as favorable as practical, if deterrence fails initially, we must be capable of fighting successfully so that the adversary would not achieve his war aims and would suffer costs that are unacceptable, or in any event greater than his gains, from having initiated an attack. The doctrine of MAD was officially at odds with that of the USSR, which had, contrary to MAD, insisted survival was possible. The Soviets believed they could win not only a strategic nuclear war, which they planned to absorb with their extensive civil defense planning, but also the conventional war that they predicted would follow after their strategic nuclear arsenal had been depleted. Official Soviet policy, though, may have had internal critics towards the end of the Cold War, including some in the USSR's own leadership. Nuclear use would be catastrophic. A first strike must not be capable of preventing a retaliatory second strike or else mutual destruction is not assured. In this case, a state would have nothing to lose with a first strike, or might try to preempt the development of an opponent's second-strike capability with a first strike (i.e., a decapitation strike). To avoid this, countries may design their nuclear forces to make decapitation strike almost impossible, by dispersing launchers over wide areas and using a combination of sea-based, air-based, underground, and mobile land-based launchers. No false positives (errors) in the equipment and/or procedures that must identify a launch by the other side. The implication of this is that an accident could lead to a full nuclear exchange. During the Cold War there were several instances of false positives, as in the case of Stanislav Petrov. No possibility of camouflaging a launch. The use of stealth technology in aircraft such as the B-2 bomber makes this assumption less likely to be fulfilled. No means of delivery that does not have the characteristics of a long-range missile delivery, i.e. detectable far ahead of detonation. Again, this assumption is challengeable with, for instance, stealth aircraft, but also with other means, such as smuggling weapons to the target undetected (using devices like a suitcase nuke). A close-range missile attack from a submarine would also negate this assumption, as would positioning the weapons close to the intended target. Perfect attribution. If there is a launch from the Sino-Russian border, it could be difficult to distinguish which nation is responsible—both Russia and China have the capability—and, hence, against which nation retaliation should occur. No rogue commanders will have the ability to corrupt the launch decision process. Such an incident very nearly occurred during the Cuban Missile Crisis when an argument broke out aboard a nuclear-armed submarine cut off from radio communication. The second-in-command, Vasili Arkhipov, refused to launch despite an order from Captain Savitsky to do so. All leaders with launch capability care about the survival of their subjects (an extremist leader may welcome Armageddon and launch an unprovoked attack). Winston Churchill warned that any strategy will not "cover the case of lunatics or dictators in the mood of Hitler when he found himself in his final dugout." No fallout shelter networks of sufficient capacity to protect large segments of the population and/or industry. No development of anti-missile technology or deployment of remedial protective gear. At an Oxford Union debate in 1985, debating the proposition that Nuclear Weapons are Morally Indefensible, former New Zealand Prime Minister David Lange argued "that the fear [nuclear weapons] inspire is not a justification for their existence," arguing instead that nuclear armament is irrational, morally indefensible and makes us insecure. There is, Mr President, a quality of irrationality about nuclear weapons which does not sit well with good intentions. A system of defence serves its purpose if it guarantees the security of those it protects. A system of nuclear defence guarantees only insecurity. The means of defence terrorize as much as the threat of attack. ^ Mutual Assured Destruction; Col. Alan J. Parrington, USAF, Mutually Assured Destruction Revisited, Strategic Doctrine in Question Archived 2015-06-20 at the Wayback Machine, Airpower Journal, Winter 1997. ^ a b Castella, Tom de (2012-02-15). "How did we forget about mutually assured destruction?". BBC News. Retrieved 2017-09-19. ^ Freeman Dyson, Disturbing the Universe, Chapter 13, The Ethics of Defense, Basic Books, 1981. ^ The Oxford English Dictionary. Simpson, J. A., 1953–, Weiner, E. S. C., Oxford University Press. (2nd. ed.). Oxford: Clarendon Press. 1989. ISBN 978-0198612162. OCLC 17648714. ^ Black's law dictionary. Garner, Bryan A., Black, Henry Campbell, 1860–1927. (Abridged 7th ed.). St. Paul, Minn.: West Group. 2000. ISBN 9780314240774. OCLC 44554580. ^ "Wilkie Collins and Mutually Assured Destruction". The Wilkie Collins Society. Spring 2009. Retrieved 17 September 2014. ^ 1828-1905., Verne, Jules, (1996). Paris in the twentieth century. Howard, Richard, 1929- (1st U.S. ed.). New York: Random House. ISBN 0679444343. OCLC 32854161. ^ "Everything You Need to Know About the First Nobel Prizes". Retrieved 2016-10-04. ^ tr. R. C. Long, Boston, 1914, p. XXXI. ^ Tesla, Nikola, The New Art of Projecting Concentrated Non-dispersive Energy through the Natural Media, System of Particle Acceleration for Use in National Defense, circa 16 May 1935. ^ Brown, Andrew; Arnold, Lorna (2010-09-20). "The Quirks of Nuclear Deterrence". International Relations. 24 (3): 293–312. doi:10.1177/0047117810377278. ^ John Barry (2009-12-12). "Do We Still Need a Nuclear 'Triad'?". Newsweek. Retrieved 2010-10-08. ^ Office for the Deputy Assistant to the Secretary of Defense for Nuclear Matters. "Nuclear Stockpile". US Department of Defense. Archived from the original on 2010-05-10. Retrieved 2010-10-08. ^ "Toning Up the Nuclear Triad". Time. 1985-09-23. Retrieved 2010-10-08. ^ Kahn, Herman. On Thermonuclear War, Transaction Publishers, 2006. p. 145. ^ Kahn, Herman. On Thermonuclear War, Transaction Publishers, 2006. p. 148. ^ Thompson, Nicholas (21 September 2009), Inside the Apocalyptic Soviet Doomsday Machine, 17 (10), Wired Magazine . ^ "50 Years Later, '2001: A Space Odyssey' Is Still an Unparalleled Marvel on the Big Screen". TVOvermind. 2018-08-31. Retrieved 2018-09-15. ^ "Gerald Hirschfeld, Cinematographer on 'Young Frankenstein' and 'Fail-Safe,' Dies at 95". The Hollywood Reporter. Retrieved 2018-09-15. ^ a b "SSBN-X Future Follow-on Submarine". Global Security. Retrieved 2011-09-27. ^ Frost, Peter. "Newport News contract awarded". Daily Press. Archived from the original on 2009-04-26. Retrieved 2011-09-27. (Subscription required (help)). ^ Keir A. Lieber and Daryl G. Press "The Rise of U.S. Nuclear Primacy," Foreign Affairs, March/April 2006, pp 42–55. ^ National Archives and Records Administration, RG 200, Defense Programs and Operations, LeMay's Memo to President and JCS Views, Box 83. Secret. ^ "Strategic Air Command Declassifies Nuclear Target List from 1950s". nsarchive.gwu.edu. Retrieved 2016-01-06. ^ a b Richard Pipes (1977). "Why the Soviet Union Thinks It Could Fight and Win a Nuclear War" (PDF). Reed College. Archived from the original (PDF) on December 14, 2013. Retrieved September 4, 2013. ^ Richard Pipes (1977). "Why the Soviet Union thinks it can fight and win a Nuclear War". Commentary. Retrieved April 21, 2013. ^ a b c Burr, William; Savranskaya, Svetlana, eds. (September 11, 2009). "Previously Classified Interviews with Former Soviet Officials Reveal U.S. Strategic Intelligence Failure Over Decades". Washington, DC. Retrieved April 21, 2013. ^ Captain John W. Dorough, Jr. "Soviet Civil Defense U.S.S.R. preparations for industrial-base war survival". Air University Review, March–April 1977. ^ Leon Gouré Reviewed by John C. Campbell (1977). "War Survival in Soviet Strategy: USSR Civil Defense". Foreign Affairs magazine. ^ Hoffenaar, Jan; Findlay, Christopher; Wenger, Andreas (series); et al., eds. (November 2007). "Military Planning for European Theatre Conflict During the Cold War: An Oral History Roundtable, Stockholm, 24–25 April 2006" (PDF). Zürcher Beiträge zur Sicherheitspolitik (79). Retrieved April 21, 2013. ^ Lloyd, Marion (13 October 2002). "Soviets Close to Using A-Bomb in 1962 Crisis, Forum is Told". Boston Globe. pp. A20. Retrieved 7 August 2012. ^ Cited in Wolfgang Panofsky, "The Mutual-Hostage Relations between America and Russia," Foreign Affairs, 52/1, (October 1973): p 118. ^ "Nuclear Weapons are Morally Indefensible". Public Address. 14 October 2004. Retrieved 3 September 2017. ^ "Nuclear Weapons are Morally Indefensible (Audio)". Public Address. 16 August 2005. Retrieved 3 September 2017. John G. Hines et al. Soviet Intentions 1965–1985. BDM, 1995. This page was last edited on 27 February 2019, at 21:19 (UTC).